Spring is in the air. Peeps are everywhere! 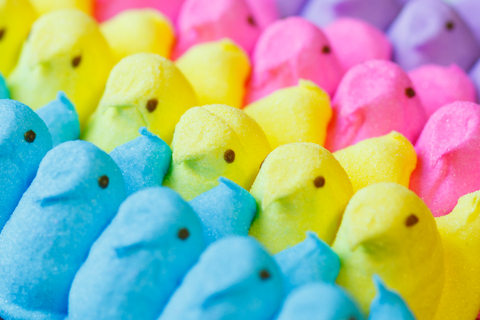 Peeps are produced by Just Born, a candy manufacturer founded in Bethlehem, PA, by Russian immigrant Sam Born. In 1953, Just Born acquired the Rodda Candy Company and its marshmallow chick line, and replaced the painstaking process of hand-forming the chicks with mass production. When founder Sam Born would display a sign for his freshly-made candy, he would title it “Just Born,” playing off of his last name and the fact that he made his candy fresh daily. According to Mary Bellis, the newly purchased company, Just Born, was soon the “largest marshmallow candy manufacturer in the world.” New shapes other than the chicks were produced following a theme according to the season starting in the 1960s.